Travertine is a natural stone with growing popularity all over the world. It’s become one of the most common choices for counter tops, floors, showers, outdoor landscaping and more. As the usage of Travertine expands the knowledge of how to properly protect and preserve the stone becomes more valuable. In order to understand the upkeep of this stone it’s important to first understand what makes it unique. Travertine is the middle stage of limestone evolving into marble. It is formed by mineral springs through a process of rapid precipitation of carbonate minerals, often at the mouth of a hot spring or limestone cave. Regularly, there are voids or holes present from air pockets trapped during formation that some fabricators choose to fill. Travertine can be found in a wide range of colors. Some of the most common colors are ivory, beige, most shades of brown and even gold. Travertine is especially sensitive to acids and alkalis that are found in many familiar household items. Everything from tomato sauce, soft drinks and cleaning products pose an issue for the appearance and longevity of the stone. One of the most crucial elements to preserving Travertine is coating it with a protective sealant. A strong sealant will guard the stone against harsh chemicals, spills, scratches and other harmful influences. If a spill is to occur, immediate attention must be given to avoid a long term issue because the stone rapidly absorbs liquid as it is porous. Regular dry maintenance, with a rayon mop, static pad or hard surface vacuum is required to remove dirt and debris that accumulates. It’s important to do this as often as possible because damp mopping is also required when caring for Travertine*. If the dry maintenance is neglected, a damp mop can cause the dry residue to take on a mud-like state that pushes into the grout** affecting the integrity of the stone. It is recommended to have Travertine professionally cleaned twice a year to ensure the stone maintains it’s pristine appearance. 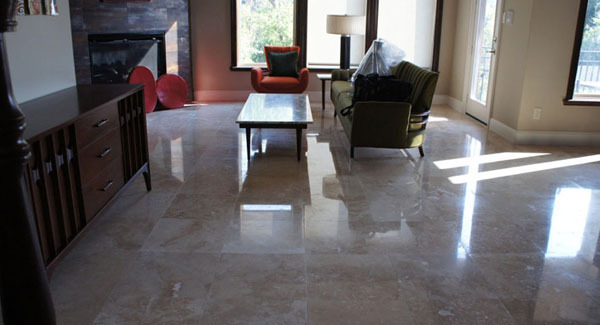 Travertine polishing takes care of superficial scratches, dull surfaces and minor etching from regular wear and tear. The polishing process should leave a deep, natural shine, with clarity and depth. In addition to improving the look of the stone, polishing it reinforces the stone’s seal. It is recommended to polish Travertine after every professional cleaning.